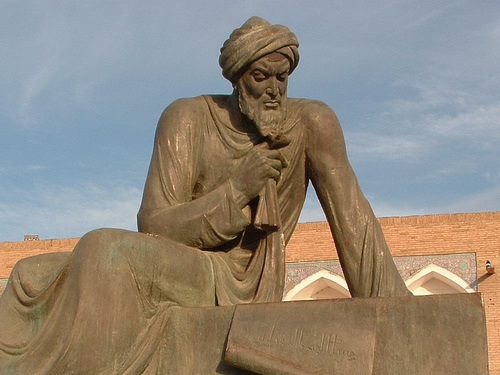 Al-Khwarizmi was a Persian mathematician. His book named Compendious Book on Calculation by Completion and Balancing was presenting the first systematic solution of linear and quadratic equations. His contributions to mathematics were so important that some mathematical terms were derivate from his name. For example, Algorism and algorithm come from “Algoritmi”, the Latin form of his name. In his main work “The Compendious Book on Calculation by Completion and Balancing”, it explain the fundamental methods of “reduction” and “balancing” which refers to the transposition of subtracted terms to the other side of an equation. Al-Khwarizmi’s method of solving linear and quadratic equations is pretty simple. We are still using it in maths courses since high school. Basically, you have to firstly reduce the equation to one of six standard forms, which you surely can recognize, by dividing the coefficient of the square and using two operations (Al-jabr and Al-muqabala). It is important to know that Al-Khwarizmi used text to present problems and solutions because algebra wasn’t existing in his time. Muḥammad ibn Mūsā al-Khwārizmī . "Wikipedia, the free encyclopedia. N.p., n.d. Web. 14 Mar. 2013. http://en.wikipedia.org/wiki/Mu%E1%B8%A5ammad_ibn_M%C5%ABs%C4%81_al-Khw%C4%81rizm%C4%AB. Overbay, Shawn, Jimmy Schorer, and Heather Conger. "Al-Khwarizmi." Math Sciences Computing Facility. N.p., n.d. Web. 14 Mar. 2013. http://www.ms.uky.edu/~carl/ma330/project2/al-khwa21.html.